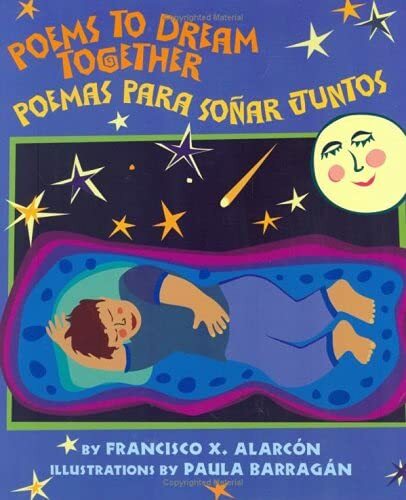 Two years ago I made sure that Poems to Dream Together = Poemas Para Soñar Juntos, by Francisco X. Alarcon, was on my county’s Summer Reading List. With a large Hispanic population here, I liked this collection of poems in both English and Spanish. Sometimes the poems were side by side, sometimes on alternating pages, and sometimes one below the other. Today, I selected a very short one, feeling that the writer would somehow be less likely to mind. After all, I am pushing his book  and I really, really am. Every public and school library should own it. The author has many other books  as Amazon so helpfully reminded me  most of them based on the seasons. This particular title focuses on all kinds of dreams, literal and figurative, and features the bright, lively art of Paula Barragan. A Wrung Sponge, haiku writer and poetry lover, is doing the Poetry Friday round-up today. If you have something to share, head that way and let her know. I have off from work today, and for the first time in a loooong time, no obligations to be anywhere or do anything for one whole day. As a bonus, it’s rainy and chilly outside, so I’ll feel no desire to sit in the backyard and read. I am going to try to bring some order to the chaos that is my home. Scratch that try  for as Yoda says, “Try not. Do or do not. There is no try.” With that in mind, I’m going to do some laundry. A lot of laundry. Thanks for the recommendation. Good luck on the laundry. I bet you'll do a better job matching up all the socks than I ever do. I love Alarcon and am delighted to see him get some press! Hi! I just found your blog via Reading Moms. I am so buying the Alarcon book. As someone who is just this side of actually being able to communicate comfortably with Spanish speakers, I'm always looking for new ways to practice Spanish and teach it to my kids. Love your blog!